WILLEMSTAD – As is tradition, the second Tuesday of September is the opening of the parliamentary year. This morning the Governor of Curaçao Her Excellency Mrs. Lucille George-Wout arrived at the parliament building to open the parliamentary year 2016/2017. She was welcomed by the delegation of three MPs, Zita Jesus-Leito, Glenn Sulvaran and Eugene Cleopa. 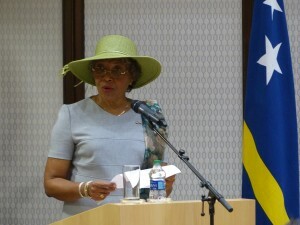 During her speech, the Governor emphasized on each Ministry of the Government of Curaçao. She talked about the accomplishments during the past parliamentary year and also about what the plans are for the new term. This official opening is different because in a few weeks there will be an election. This means that there could be another government with other plans during the parliamentary year. Notably, the only opposition MP present was Omayra Leeflang. All other opposition MPs were not present because, according to them, the opening of the parliamentary years is illegal. Yesterday during the closing of the parliamentary year 2015/2016 there was no quorum for the meeting to take place. Please visit our Facebook page for more pictures.